Flying is both magical and exhausting. To get up at 4:00 a.m, drive an hour plus to the airport an hour plus early just so a stranger can send you through a cattle call of pat-downs and orders takes so much away from the elegance of flight. It’s a day of moving along and waiting. Still, it’s a miracle. We get out of bed in Oregon and bed back down in Alaska. So what if one has a few bumps and bruises along the way. 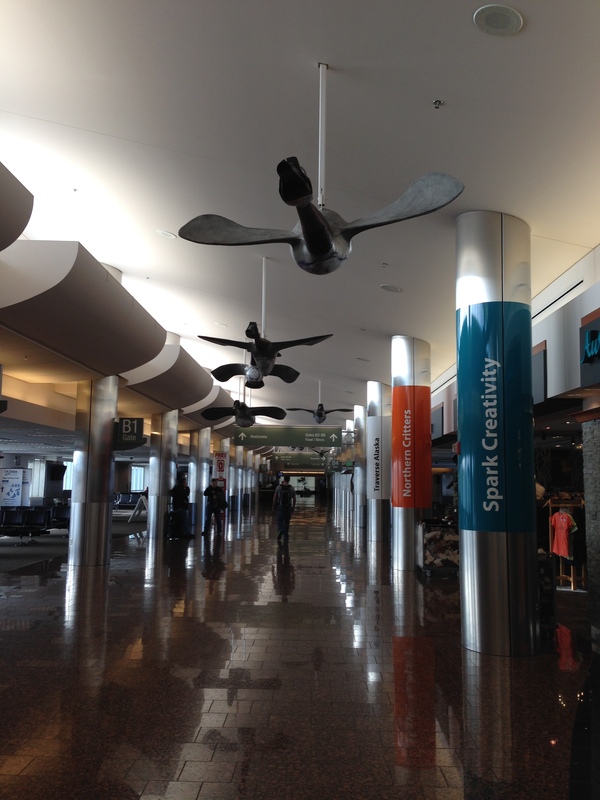 PDX to Anchorage, a lovely airport, but aside from the beautiful sculptures of flying geese the rest was filled with tourists traps and high priced food….the usual terminal. 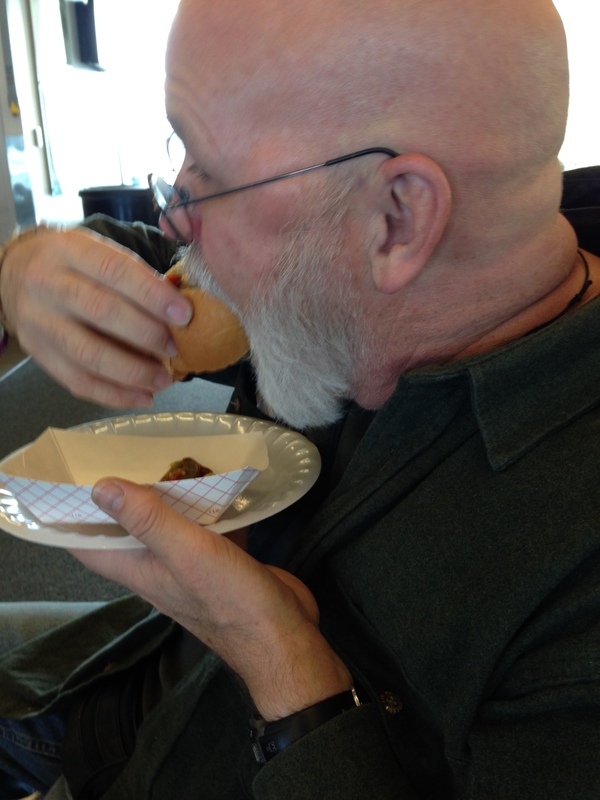 It was in the Anchorage terminal that my husband ate a reindeer hotdog. I refused because, while I am an unapologetic carnivore, I will not eat any animal that might have been part of Santa’s pack. “I owe it to the children,” I explained, straight faced. 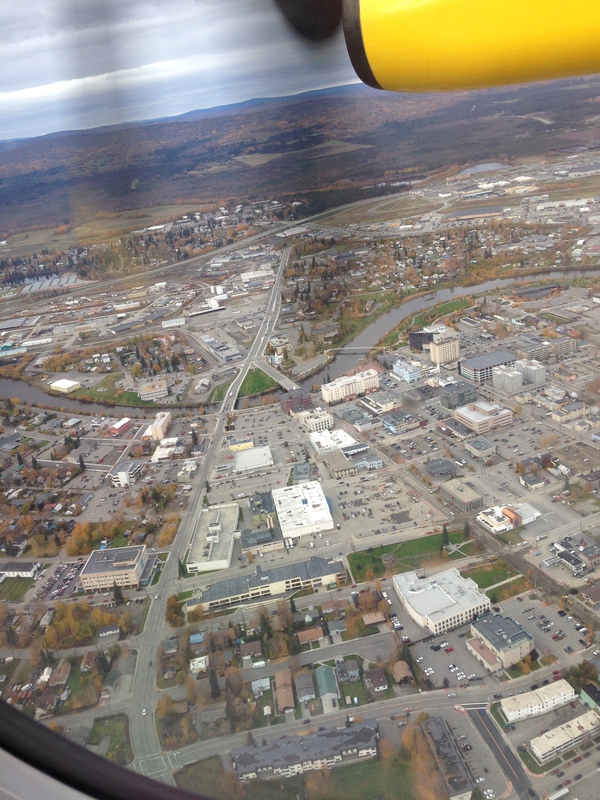 From Anchorage, we took a smaller plane, to Fairbanks. 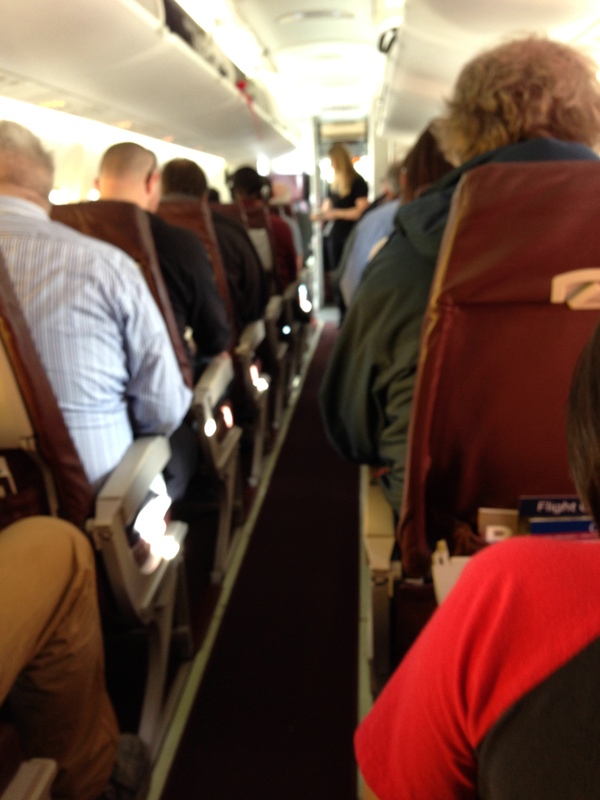 By smaller, I mean that we left the terminal and got into the plane (with propellers) on the runway. It was a short flight to Fairbanks. It appeared that both the Anchorage and smaller Fairbanks airports had their fair share of large stuffed animals in glass boxes. Not something I see every day. Although tired, we hadn’t had any delays so were grateful when the hotel shuttle picked us up to take us to our hotel. All were welcoming, and we were doing well until we got out of the elevator at our floor. The smell stopped us in our tracks and caused us both to use words not acceptable in this post. We got half the size of our original room on the ground floor (because we both yelled – We’ll take it.) No smell. Yeah Westmark Hotel! The evening was not yet over because I had to go back to the original hotel so we could battle with Orbitz who thought I was trying to pull a fast one. Orbitz wanted us to pay for the entire stay in the hotel even if we were not going to stay there, because….Orbitz. Again, the first hotel was helpful and explained to several representatives our situation. It cost us a night’s rent and FOUR HOURS of our vacation, but emergency room costs would have been so much more. Robert went around the hall to the fancy restaurant and ordered desserts for everyone at the front desk. We finally made our last trip from the (still unnamed) Hotel to The Westmark. We dumped our luggage in the new sweet smelling room and went to the restaurant lounge for something to eat. We had been up since 4:00 a.m. and had little to eat. It was now 9:00 p.m. We dragged ourselves into the place where people were eating and chatting. We were hungry, dehydrated, and exhausted. “Food, we need food.” I was ready to pass out. Robert and I sat there looking at each other and just started to laugh – maybe a little hysterically. Off she went to take our orders and we slumped down on the table. 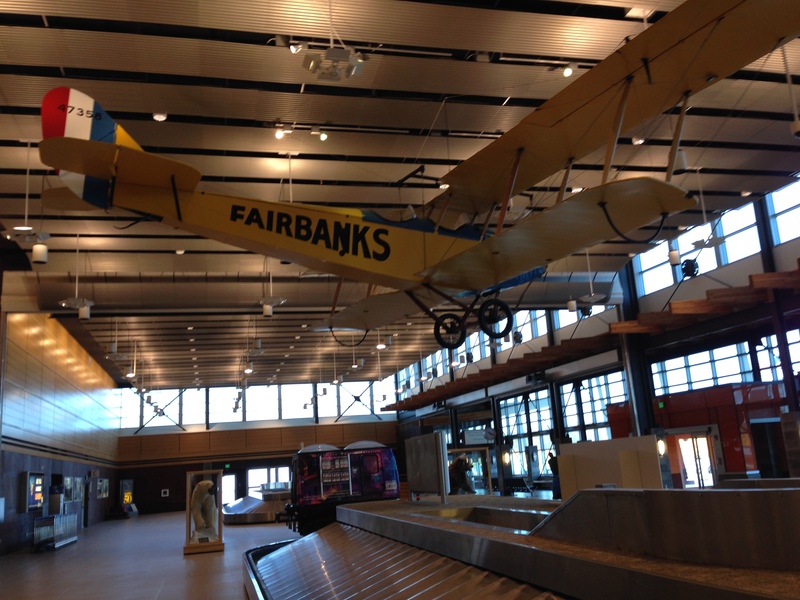 When you think of it, 17 hours of travel seemed like a lot, but we were in Fairbanks, Alaska! The piggy and fries arrived. This, dear reader, is a diabolical meal that could keep you warm for a week. 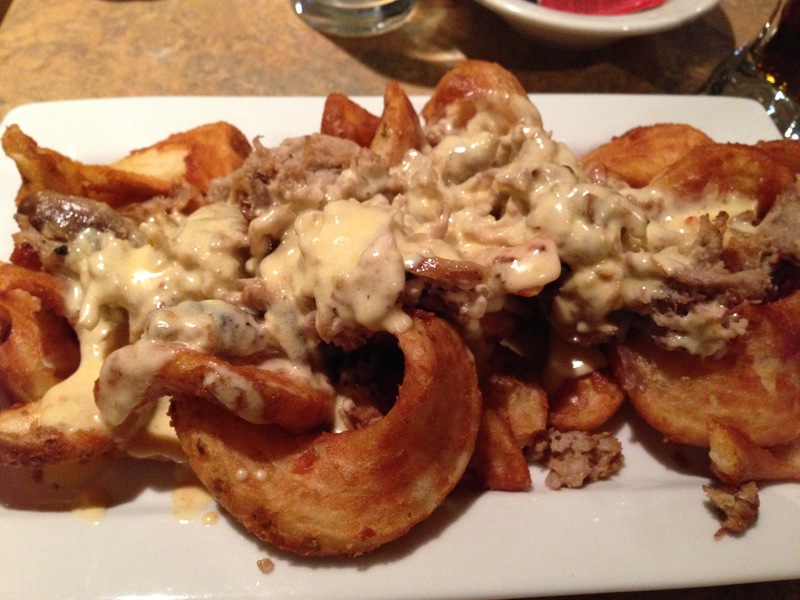 Special fries called “sidewinders” covered in pulled pork and cheese gravy made from scratch. This is the anti-salad. The picture may not do it justice, but I still dream about it. 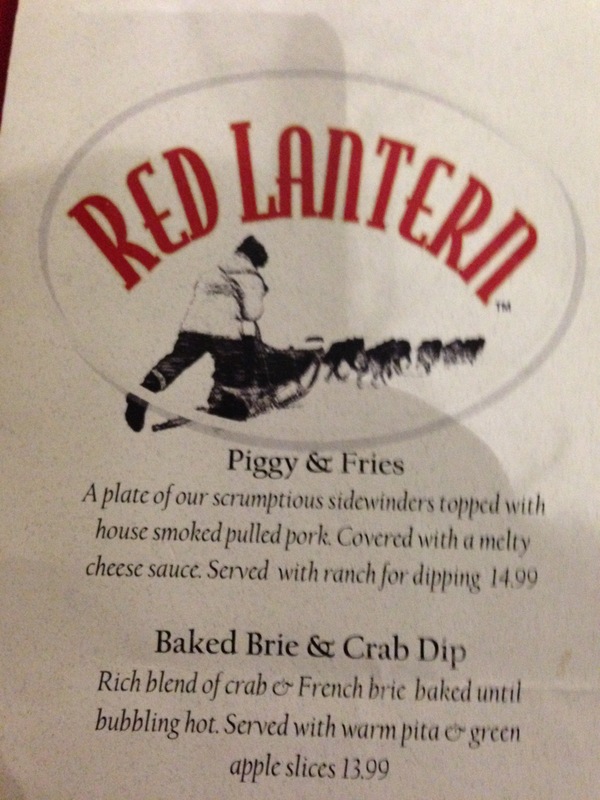 The brie and crab dish was tasty with tart apples on the side. We thanked our angel, and headed to our room. That room was our home for the next six days. On the last day, we awoke at 4:00 AM and reversed the process. 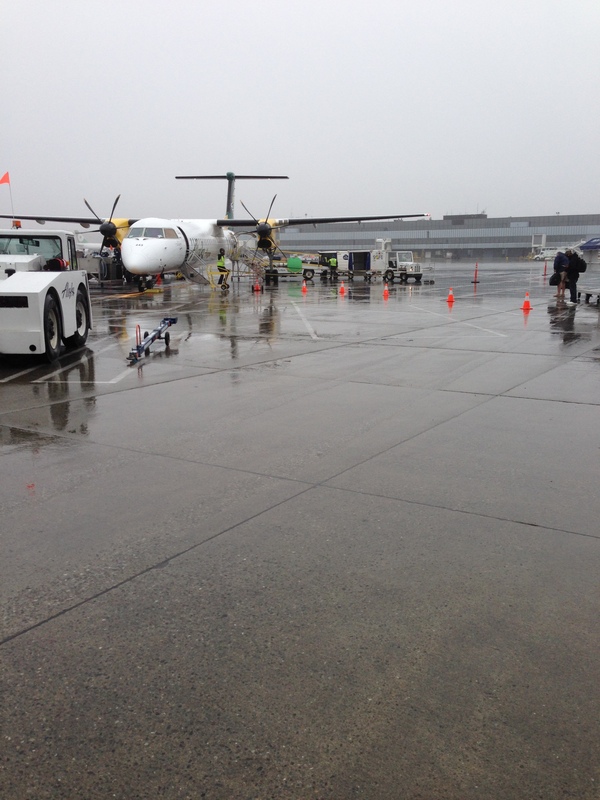 Little plane, wait, big plane, PDX, shuttle to our car, drive to Salem, HOME. I am curious about what was in the hall/carpet/rugs whatever. Funny story about your trip from Japan. Shorts in a snow storm…that would be something!